The ancient Egyptians respected dwarfs, and did not see them as having a physical handicap, according to a study by US researchers. A team from Georgetown University Hospital looked at biological remains and artistic evidence of dwarfism in ancient Egypt. Ancient Egyptians worshipped dwarf gods, and many dwarfs held positions of authority in households. The research was published in the American Journal of Medical Genetics. In modern times, doctors have identified over 100 medical conditions that cause short stature. The most common cause is achondroplasia which causes severe shortening of the limbs. It affects one in 25,000 births per year. Around 75% of individuals with a restricted growth condition are born to parents of average size. The US researchers looked at ancient Egypt because the hot, dry climate and elaborate burial systems practised then have meant many human remains are still intact, including complete and partial skeletons. They looked at dwarfs who achieved "elite" status in society, and ordinary dwarfs. The researchers found that the earliest biological evidence of dwarfs dates back to a Predynastic Period called the "Badarian Period" (4500 BC) in addition to several skeletons from the Old Kingdom (2700 - 2190 BC). They found numerous images of dwarfism on tomb walls and on vase paintings, statues and other art forms. 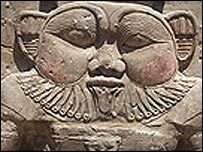 Dwarfs were depicted in at least 50 tombs, and the repetition of certain pictures shows that they were well integrated into society, the researchers said. The pictures showed dwarfs were employed as personal attendants, overseers of linen, people who looked after animals, jewellers, dancers and entertainers. Several were members of households of high officials and were esteemed enough to receive lavish burial sites in the royal cemetery close to the pyramids. There were also two dwarf gods in ancient Egypt; Bes and Ptah. Bes was a protector of sexuality, childbirth, women and children. His temple was recently excavated in the Baharia oasis in the middle of Egypt. Ptah was associated with regeneration and rejuvenation. "The burial sites and artistic sources provide glimpses of the positions in daily life in ancient Egypt," wrote Dr Chahira Kozma, of the department of paediatrics at Georgetown University. "Dwarfs were accepted in ancient Egypt; their recorded daily activities suggest assimilation into daily life, and their disorder was never shown as a physical handicap." He added: "Wisdom writings and moral teachings in ancient Egypt commanded respect for dwarfs and other individuals with disabilities."